Something I’ve learned a lot over the last few years is that you can’t just launch a course to the world and expect students to start registering. You need to build an audience, and then build trust with that audience. If people are going to hand over their hard-earned cash, they need to know you’re the real deal. The best way to do this is to blog, create videos, and start podcasts where you’re teaching in the open. Give away a little bit and capture email addresses. These email addresses will be the life’s blood of your new course when you launch because these are the people who trust you. Building an audience through content may not be enough. You need to create a sales page, partner with people who appeal to your target audience, and maybe even do targeted ads. Partner with folks to do webinars and have a special offer for attendees. Go on podcasts and add value for the audience. Don’t just pitch your course. Talk about your experience, give good advice. When the hosts asks where people can find you, mention your course. Release a free mini-course that serves as a funnel to your full course. This can be a small (3-5 video) introduction to the main topic. These tend to do really well, especially when paired with the right Facebook Ads. I’ve also started experimenting with Instagram Stories. According to The Science of Social Media, Instagram Stories provide great engagement and reach. So I’ve started doing a 101 series in my stories. Speaking Events online and at conferences. Traveling will cost you some money if the cost isn’t covered by the conference, but speaking is one of the best ways to establish authority in your field. Automate emails to start conversations. Connect with them at the start, in the middle, and at the end of the course and ask them pointed questions. When they respond, you respond in turn. Have a Forum or Slack Team. This helps you not only field questions, but also build a community among your students. For courses with start and end dates, have office hours. Each week add time to your calendar for when students can connect via chat or video and talk to you in real time. Very few people get it completely right on the first try. Engaging with your students also helps you gather feedback to make your course better. Take that feedback and iterate: add or remove modules, create better resources, etc. Don’t let your courses stagnate. Especially if you’re working in technology, make sure to refresh the course every so often to keep it up to data for current and future students. 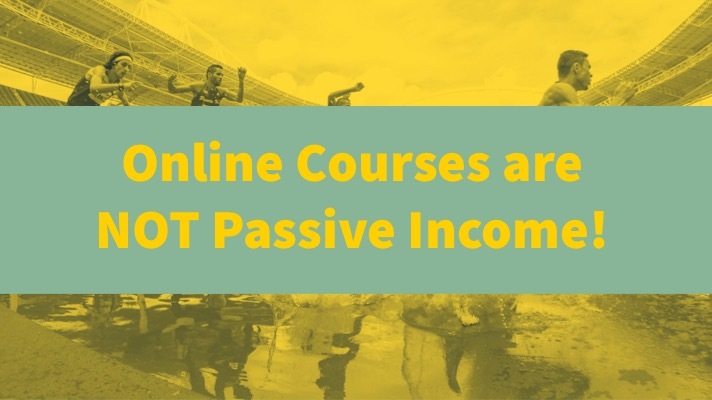 If you approach online courses from the right angle, and assume that they are rewarding work instead of passive income, you will have better courses, happier students, and you have the potential to create strong relationships.